I love to garden; it’s fair to say I’m passionate about it. Love the hard work (and there has been plenty of that, real blood, sweat and yes, even tears!) and love spending time enjoying the results. Spring/early summer, it’s not just one day, but whole weekends and now it’s starting to come together again this season as the haven I love. This has been a 15 year exercise in building a waterwise garden so grass is limited, plants are drought tolerant and those that can’t survive without regular water; well, they get removed. Believe me, getting a garden to look abundant without a lot of water; that has been the challenge. Before a neighbor decided to remove all of their large cottonwood trees, this area was so shaded it was difficult getting anything to thrive. It was a shock when they removed the trees, but opened up the opportunity to have an area close to our family outdoor dining that was bursting with color all summer long. 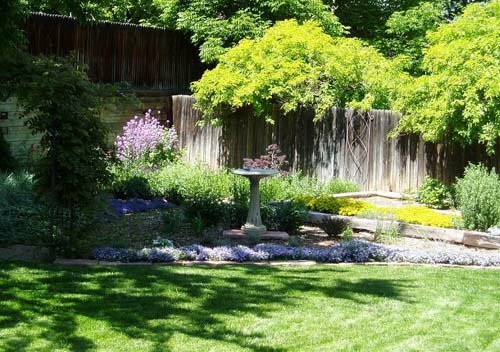 All of the larger shrubs thrive with very little watering; hidden in this picture behind the iris is the small pond that provides a soothing and refreshing water feature. Here are pictures of our little pond; one from covered patio and another up close and personal! 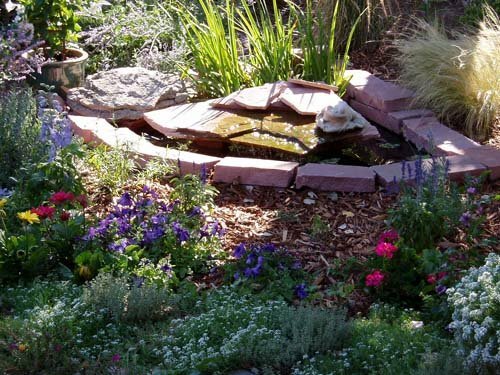 This is the third try and it’s staying…really is a water feature; no fish or plants but just a soothing trickle; serves as the best birdbath in the yard! Abbie also drinks from the pond; it’s our version of having wildlife come to the table! This Back Forty – Feet That Is! 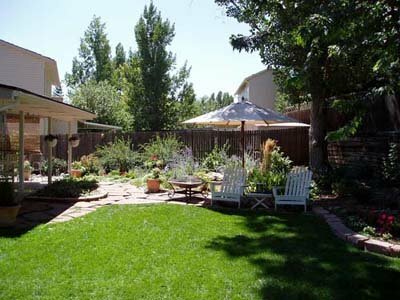 The wide expanse of green in the backyard has been reconfigured so that the grass is a small, interior part of the overall landscape; outreaching areas have been planted with Colorado penstemon, lavendar, large sedum, herbs and other bushes, groundcovers and perennials that can survive Colorado’s dry conditions without constant watering. I have my own personal virtual game…it’s a contest with Denver Water. It really is amazing how little water we use; not just for watering, but indoor use is also curtailed with water saving appliances and fixtures and posted reminders for those who think it doesn’t mean them. And yet our bill either goes up to make up for others waste (after years of drought restrictions, really, how do you see your sprinklers watering the sidewalk and not do something about it?) or when we all conserve really well, it goes up because their revenue is down! It really is like having another room! They may be winning overall but I am fighting the good fight and was once featured on the local news as a result of our indoor and outdoor water conservation efforts. I recall the news anchor that came to our home ending the segment with the line that I was so focused on water conservation that I only tolerated my children having a little dog because she drank less! Hadn’t thought about that (seriously!) but hmm, maybe a good thought. My concern with keeping a dog under 30 lbs had a bit more to do with maintaining that grass folks! This picture is of our garden arbor with what appears to be a healthy and thriving wisteria…except for one small detail; it has had one flower, and that was last year. Maybe they have to mature, maybe it doesn’t get enough sun; maybe I don’t care because I think it’s beautiful just the way it is! The iris have been beautiful this year. Planted about 5 years ago when neighbors decided to trim back their iris bed, they were ALL yellow; seems this purple version is determined to succeed though; we had several years of all yellow flowers but the past two years have seen more and more of the purple flowers appear…maybe it’s just magic! Another grass to flowers story; the area pictured is the driest spot in the front yard. Bordered by our front sidewalk and the neighbors total rock area between their driveway and our lawn, it was the one place I struggled with how the grass looked. About four years ago, we removed the grass and created a sweeping flower bed. 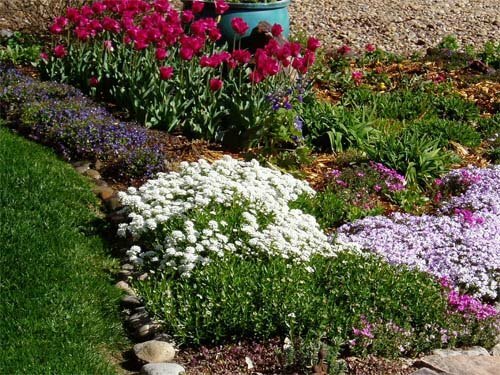 Now we look forward to perennials, ground covers and a burst of color in spring from tulips and later in the summer from dinner plate dahlias. Just had two small and dying aspen removed from near the house so excited that this area that only used to get morning sun now gets a dose in late afternoon as well; it will be welcome. 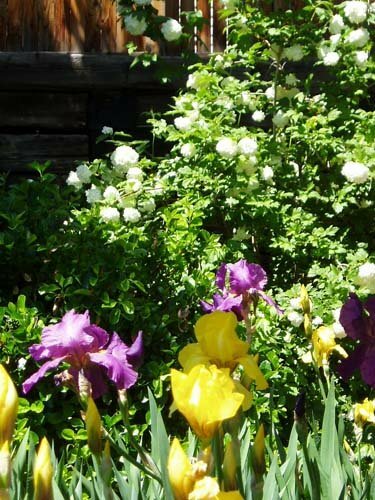 I love the spring, always a new surprise it seems…that is one thing I love about perennials! 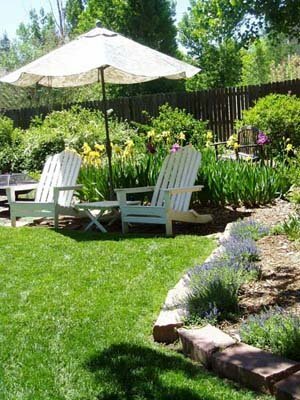 For more information and recommendations on growing a healthy lawn, please visit our page with our personal tips for success!